I finally cooked my biggest Emergent to date, the tulip lady (AKA Emerging 1), and decided to go for color instead of the all-cream palette I’d just about decided on. Kiln had cooled down, so I opened it to peek, and got the expected Christmas and train wreck moments, all rolled into one. First the train wreck: The R&R910 didn’t hold. Not sure why–because I babied that bloody mold and made it thicker than it needed to be–but the mold split at the left-hand third, near the top, and flashed to about 2/3 down the panel. Since I’ve had the mold sitting in my studio for several months, I suspect I at some point bumped it and caused a small crack. At the top, though, 3-4 pounds of crystal headed south, through the crack (dammit). I did not, thankfully, wind up with a glass kiln floor (thank you, kilnwash gods), but I do have one of the most expensive pot melts around. –sigh– As a result, the piece is thinner at the top than I wanted. And the lady is sporting a big honking fin over an eyebrow, one that heads down toward the center of the piece. But now for Christmas: The flow of glass took care of my one worry when charging the mold: That no matter how flowing my application, I wouldn’t get the wispy, organic shading I was after. Thanks to the hole in the mold, I got all the flow of color I could want, and it did a kind of potmelt thing within the work itself that’s going to clean up VERY nicely. I think. 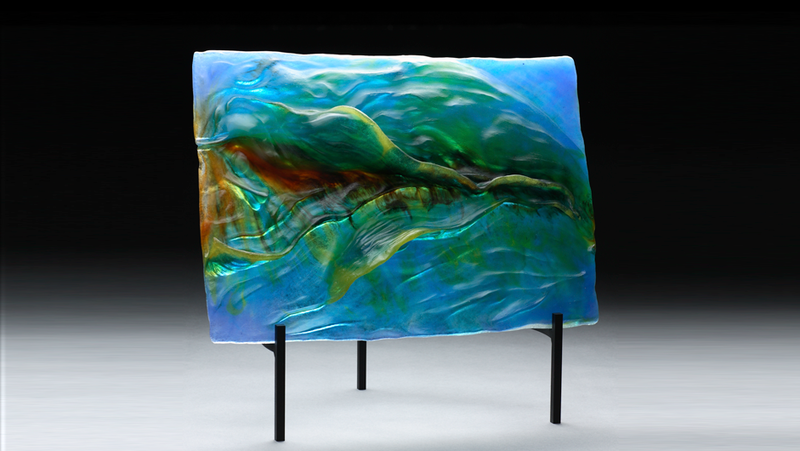 For the most part, the glass flow direction follows the movement of the piece. Did we get flow? Yeah, babe. We got FLOW. Also, the surface is well-nigh flawless. Yum. Apologies for the crummy pictures–she’s a little more stunning in person. P.S. Got the flashing off this weekend, unruffled the lady’s feathers a bit. Now she’s ready for a light sandblasting and some acid polishing. Well Cynthia, this is an absolutely beautiful piece. Are we going to see it at the Glass Gallery’s Gathering of the Guilds Show in May? After the holiday nuttieness, I’ve got to try some casting. As always, you’re an inspiration! This looks to be a beautiful piece and I also can’t wait to see it finished..Sometimes syncronicity adds an unexpected and wonderful addition to a piece. Thanks, Les. Well…I’ve done a lot of small casting with aperture pours, where the glass flows IN…but it stops. What I like about this is the flow through, as if the color is rushing past. So…I’m wondering if there’s a way to control this reaction and at the same time control the color movement. Place more glass than you need in the mold, put a hole in a sacrificial corner you plan to cut off anyway, and let the glass move through the piece into a reservoir (and I guess make yourself a really nice potmelt).